We are trying log in all the books, and eventually all the magazines in the shop. Right now all the books are layed out in the sale room for us to count and put in the computer. It is a great time to stop by and see all the wonderful titles we have at the shop(and possibly pick out a couple of books you may be interested in). I am guessing this will take the rest of the week, so stop by and take a look. Sat is Ravelry and Overnighter Day (that last bit sounded odd, but oh well). Join us for one or both of the fun events! Don’t forget that Sarah Burton will be here tom. (thurs) with her Mosaic Designs and patterns. There is no cost and you can work on existing Super Bowl Scarves if you want! Time is 5-8 pm. Don’t forget Sarah Burton will be at Mass. 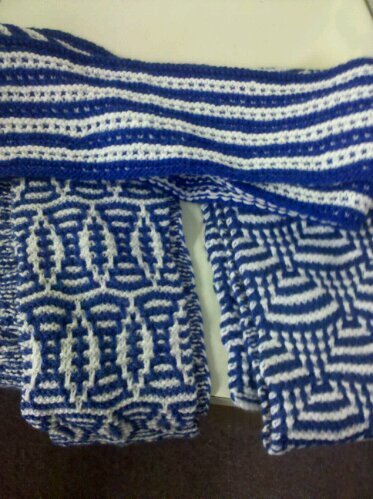 Ave. Knit Shop this Thursday May 12 to demonstrate Mosaic Knitting .We will be knitting from 5-8pm. All are encouraged to come and see some of her amazing designs. (Photos are of 3 of her scarves! ). Okay I messed up the schedule, THIS sat is both Ravelry and an OVERNIGHTER!! RAVELRY starts at 12 and the Overnighter starts at 7:30!! YEH!! 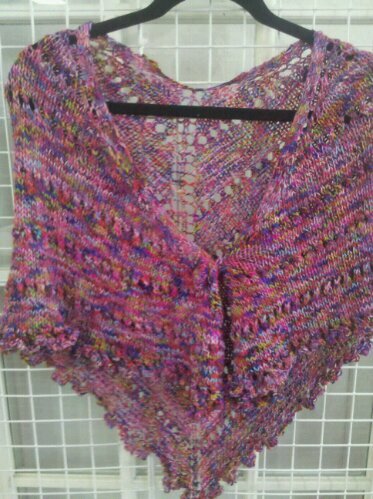 MASS AVE KNIT SHOP is joining CLASSIC ELITE YARNS in a spring KNIT ALONG! -details: Choose any Classic Elite Summer Pattern using at least 2 balls of yarn and ANY Classic Elite yarn (winter or summer ). Projects must be completed by July 31. All those who participate will go into a drawing to win a $100.00 basket of goodies from Classic Elite yarns. Each store that participates will have a winner!! We only need 5 people to join the KNIT ALONG. Come in and check out the patterns. Mass Ave will put your name in the pot 1 time for every extra ball you purchase after the 2nd ball, so if you do a sweater you have a better chance of winning, but all are welcome. Our 1st participant is doing the cute cable bag out of Sprout! Come join us -remember that projects must be complete by July 31st to be considered for the drawing! We will meet together if you want. We can meet either eve or sat. Just let me know! !